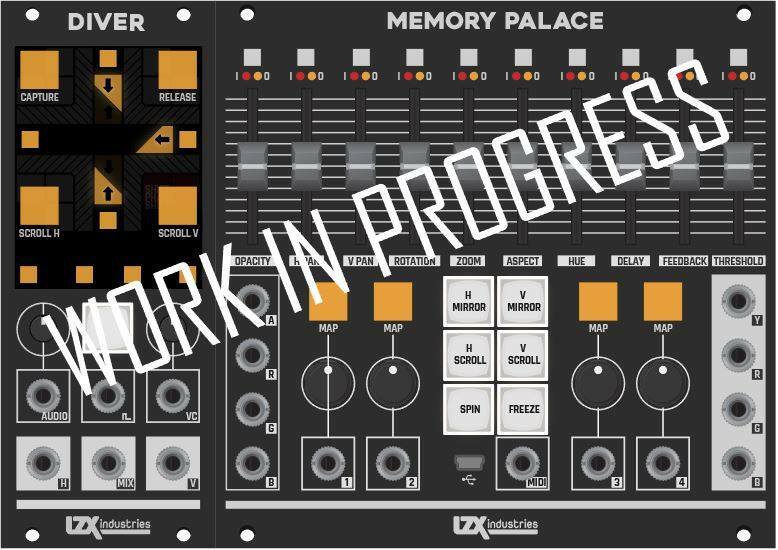 Memory Palace would be a good name for the sequencer module that was at last year's NAMM. 26hp would be about the same size, I think. The other names are more helpful, at least. So, a very tasty announcement. Thanks. For a newbie to these great LZX modules, can you explain what these do? I’m a Eurorack guy becoming fascinated with reactive visual possibilities. Disclaimer: some wild speculations follow. Memory Palace, 26HP, 32-bit ARGB Framestore & DVE. Probably a framebuffer, to capture and hold a complete frame. So, maybe think of it as a video sample & hold? DVE is short for Digital Video Effects. Who knows what that means here - mirror effects? Rotation? Scaling? Diver, 16HP, Audio-to-2D Visualization Sampler. I guess this turns audio into video. Maybe something like the Critter & Guitari ETC? Bell Chamber, 16HP, Dual Frame Synchronizer & Video Decoder. This would be the new TBC module, I guess. 2 video inputs, no genlock needed. 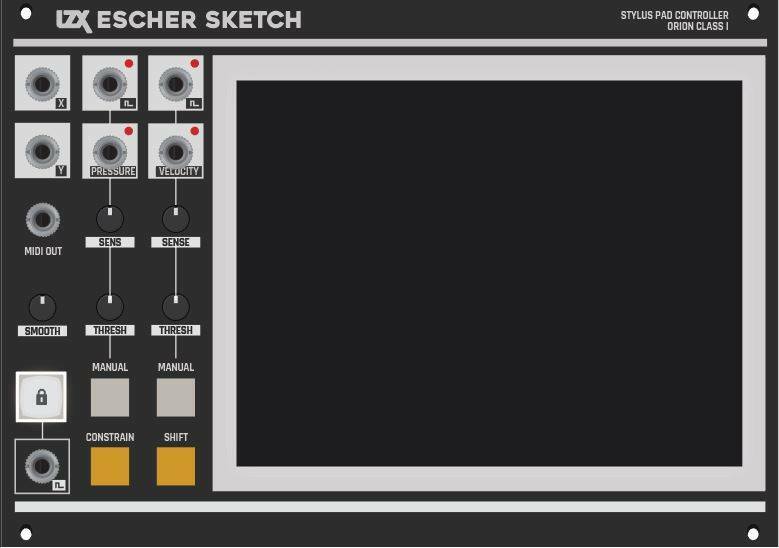 Stylus, 20HP, Stylus/Touch Drawing Interface. What the I don't even. Reposting here from the facebook group some details on the upcoming Orion series of modules. Here is a very quick look at Diver and Memory Palace interfaces in progress. With digital module development we've been able to sort out some core features on our development boards and work on the interface later -- with analog modules I prefer to start with the interface and work backwards to the right circuit. So there's a lot to think our way through and creative freedom with the digital module interfaces and control schemes. I'm happy to answer questions on either of these, just please realize they are both quick sketches and not proposed final UIs -- a quick glimpse at a much larger picture. There are a few things decided on for the design language: lots of sliders, custom segment LED displays, powdercoated panels in a warm dark gray with white silkscreen, and a blend of colored tactile switch caps and clear broadcast console style caps with film inserts. The design language has been careful to line up perfectly against Expedition series panels, with consistent placement of lines and component grids, and the color palette is a nice muted contrast against Expedition's silver and blues. These two series are meant to be 2 parts of a larger system concept. We do different series in order to define new design languages to work within (which are quite strict about inside a series.) 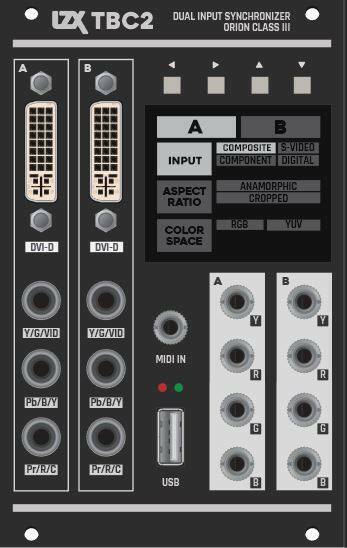 So the reason Orion Series is a new approach is because it warranted a new type of interface language, one which has more buttons and is more performance focused. man ive been waiting on modules with this functionality for many many years. "We've been waiting to reach some production/restock milestones before officially opening Orion Series preorders, and we are finally at a comfortable point there. First article units along with exhaustive details on specs/feature sets will debut at KnobCon 2018, September 7th-9th. This is a soft launch -- no sales pitch, no special prizes (other than being first in queue) -- the promotional push begins at KnobCon. If you have the ability and desire, your preorders will make a huge difference in helping us make the bulk components purchases we need to make in the next few weeks to ensure strong launches in October/November. While the HP sizes, pricing and core layout decisions are locked in at this stage, we still appreciate your questions or discussion about features and workflow on these new video synthesis tools (discussion always helps us understand how you are understanding!) This is an exciting announcement for me personally, as these concepts have been at the end of a development project list I wrote down nearly 10 years ago now and that we have been aiming at ever since. More info at https://www.lzxindustries.net/shop "
"Help us make Orion Series a reality! Read this before ordering. While early prototypes date back several years, we've been working on the Orion Series hardware in earnest since early 2017. As of the date of this notice, late June 2018, we have multiple custom digital hardware development environments and interfaces running our code, component supply chains have been established, and the countdown to the production release has begun. Our next steps involve assembling the first revision production units throughout July 2018. Throughout August 2018 we will be making revisions, writing more code and tying up any loose ends. First production units along with complete specifications and feature lists will be revealed during our appearance at KnobCon 2018, September 7th-9th. Frontpanel images being shown are subject to some final revisions throughout the next few weeks, but any illustrated features and HP sizes are commitments at this point. Making esoteric video processing devices for a niche market of weirdos and video freaks is not easy. We rely on you to be part of the team that makes it all possible, and in this case we need to raise funding for bulk components purchasing several weeks ahead of our launch date. We have dealt with lengthy production delays across multiple products this year, but have undertaken many successful initiatives to resolve issues in our supply and manufacturing chains. We have a firm schedule and solid plans for ensuring these modules will ship on schedule, and will communicate with you each step of the way. We will ship all orders in the order they are received, and you will have access to your position in the shipment queue at all times via your user account on our website. If the volume of preorders exceeds our production capacity for the initial release timeline, we will stop accepting preorders until expectations for a followup production run can be safely established." I am a quiver with anticipation for any demo vid's!!!! Three or four years ago when I first saw my friend/collaborator’s LZX modular system I said, ‘Cool, but can it do that thing in Song Remains the Same when Jimmy Page turns into a wizard and raises his staff/violin bow up into the air and it makes a bunch of trails?’ half jokingly. My brain lit up when I saw that same effect in the demo video, in the footage of the operator at the control panel. This is a frame buffer, correct? But if I’m not mistaken, LZX already has a module with a video frame buffer? can't wait for more demos!!! Does the Memory Palace decode NTSC composite input video? I'm wondering if TBC2 will output Y/R/G/B from a composite analog signal, or just luminance, like the Visual Cortex? FWIW, the original TBC outputs Y/R/G/B from composite/s-video. If you want Y/R/G/B from the VC, you can use a component input from a composite->component converter. (That's how I do it, BTW.) The TBC/TBC2 modules obviously have much more complex decoders than the VC. I think this is reasonable given how much is packed into that one module. Inspired by the legacy of early computer graphics generation, Fortress is a low bit depth video pattern generator and colorizer module. 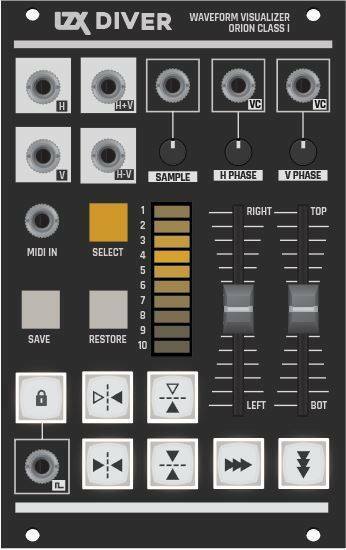 Fortress embraces the 3-bit patching workflow standardized by the LZX Castle DIY module series. A complete voice for your video synthesizer, Fortress includes 3 oscillators and 3 lo-fi ADC channels feeding a complex logic core with many operational modules. Selectable programs include Weaver, Arithmetic, Random, Shift Register and Posterize. Selectable output palettes include RGB, CGA high intensity 1 and 2, and other gradients. Nice. I love it. Might be the first Orion module I get. 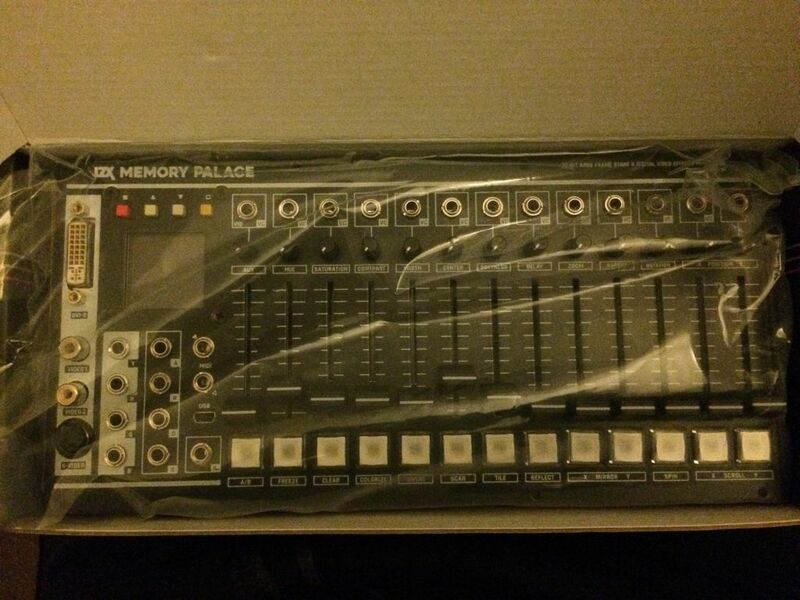 Got a chance to get my hands on Memory Palace at Knobcon...Euro Video Synthesis is about to get turned on its head.